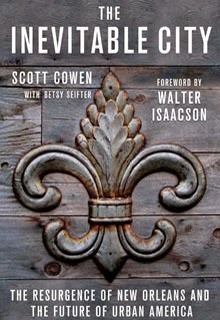 On the day the Scott Cowen’s book, “The Inevitable City: The Resurgence of New Orleans and the Future of Urban America” is released, he will be at the Uptown Jewish Community Center for a launch party. A book signing and dessert reception will follow the 7 p.m. event on June 10. Cowen will share his perspectives on leadership, Hurricane Katrina, Tulane University and the rebirth of New Orleans. The event is free and open to the community. The book details the challenges faced after the levees broke following Hurricane Katrina in 2005, and chronicles the rebirth of New Orleans, which he says is an inspiring example of urban renewal and revitalization. The book presents 10 principles that changed the city’s trajectory as a coalition of civic, business and non-profit leaders worked around the old institutions to bring about change. Pre-orders are being taken at Octavia Books and will be available for pickup and signing at the event, and additional copies will be available that night. The book is being released nationally on June 10, though there was a preview held at Tulane on May 15.